As a DIY enthusiast you’d think I always make stuff rather than buy it. Many times this is true. However, I have found there’s more to it than just what you pay at the register. 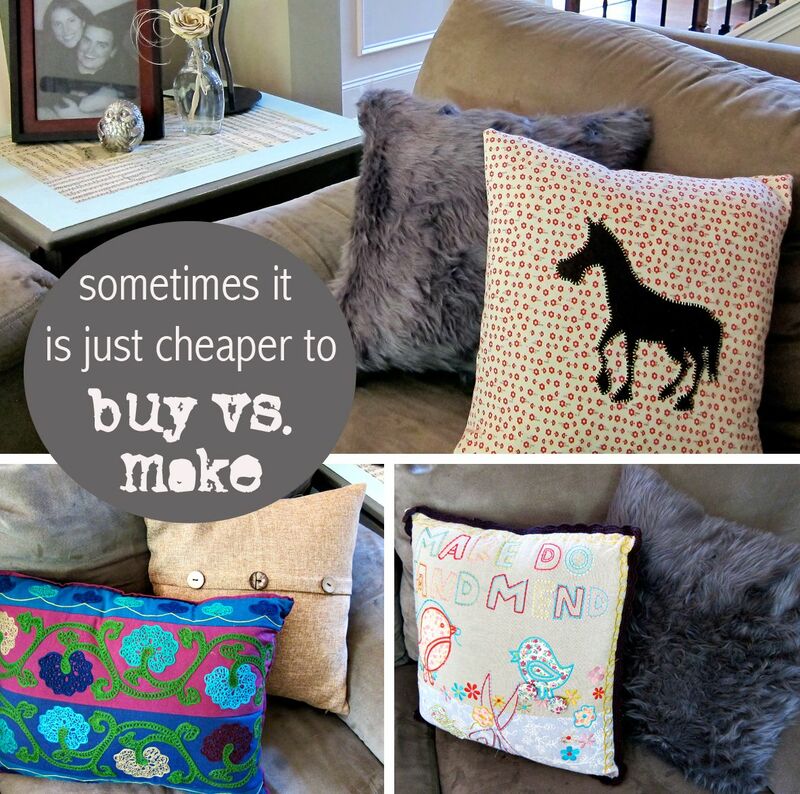 In this post I discuss Buying vs Making. What is the value of your time? Do you ever find yourself thinking “this ______ just cost me ______ amount of time?” I do. I often think it when I’m doing something I really don’t like and have a million other things I would rather be doing. Being a stay-at-home mom, as many of you already know, is more than a full-time job. Add in the desire to be consistently creating new projects, and whew, time is scarce. More and more I’m trying to value my time and think smart when working on new projects. The truth is if I spend a few extra dollars on a project that enables me to complete that project quickly and move on to the next, then those extra dollars are getting a good return on the investment. Other times, I find items on sale that turn out to be as cheap or cheaper than making it myself. Isn’t that like cheating? Again, if you are anything like me and value your time and have a to-do list a mile long, then no. Check something off of your list so that you can move to something you really love or care about. This recently happened for me. Ever since Matt made me our bench for the foyer (and it stole some of my couch pillows), I have had on my to-do list the need to make more pillows for our living room. I love pillows. I love making them and buying them. They are such a cheap thrill that can totally create a large impact in changing the feel of a room. Even though I do enjoy making pillows, making four would take me a lot of time. I was browsing Hobby Lobby the other day and found something, which was a purchase, that saved me significant amounts of time. In Hobby Lobby’s upholstery fabric aisle they have a section of premade curtains and pillow covers. When I happened to be in this aisle a few weeks ago, those items were 50% off! That made the cost of pillow cases $3.50-$4.00. What a deal! If I had bought pretty fabric, a thinner fabric to use as a liner, and a zipper I could not have made a pillow cover for less. I was so impressed and excited. This is not a sponsored post. I just love Hobby Lobby and wanted to share that sometimes it is cheaper to BUY something than to MAKE it. The cost of supplies is one thing but the amount of time I saved is really the bigger savings. 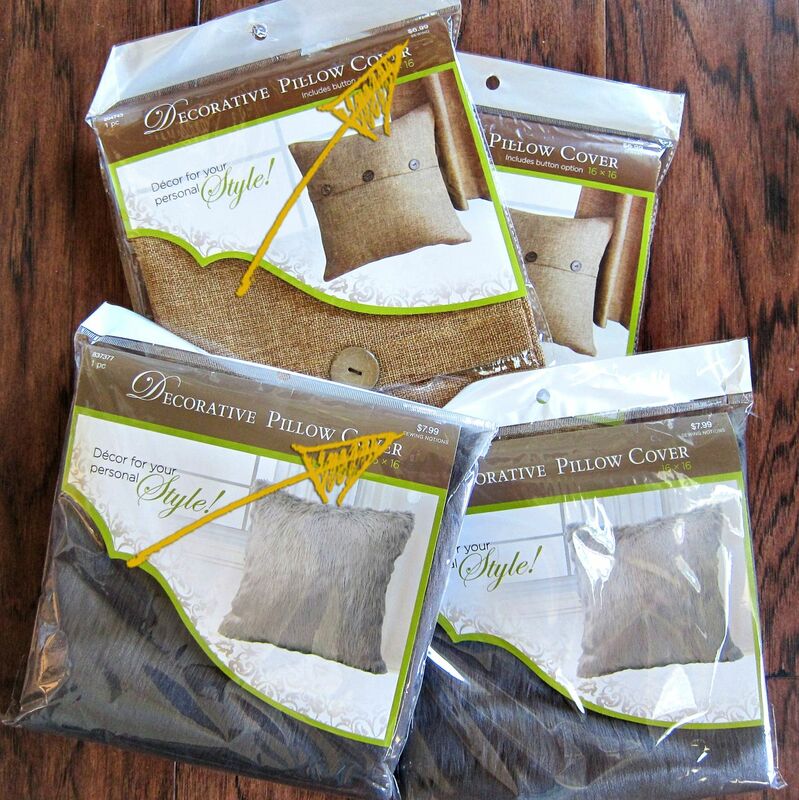 I had some feather pillows literally stacked in a closet waiting to have covers put on them. I scored these Pottery Barn pillow inserts at a Goodwill months ago. They were in almost brand new condition. 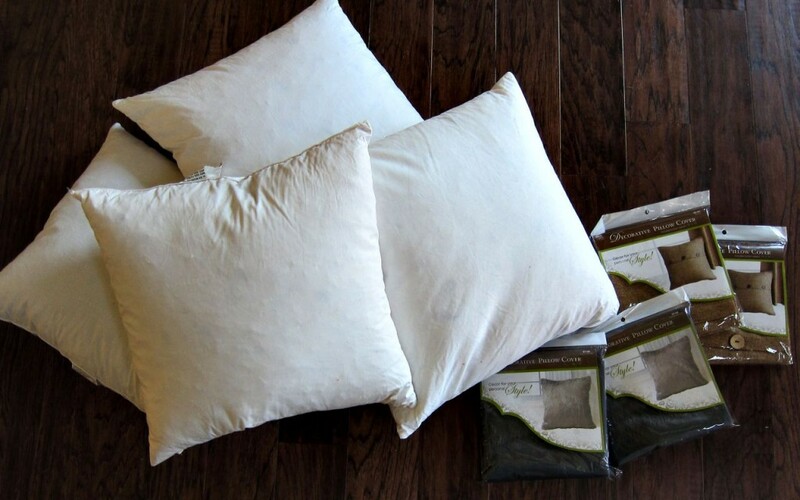 I brought my pillow inserts home and covered my pillows and all of a sudden I had four brand new pillows on my couch at a minimal cost of dollars and time. I do want to make some embellished fun pillows to add to this collection, but having some basic yet pretty pillows there now feels so good. Did you know that Hobby Lobby sold premade pillows? I picked the fun fur one (that my kids fight over using) and the basic burlap/canvas with button covers but there were so many more to choose from. They even had chevron in lots of colors. Now that I freed up all this time knocking out my pillows I’m ready to head back to Hobby Lobby to get supplies for the next item on my list! What are you all working on this week? Any big projects??? What are ways you fight to not only save money but also time in your projects? Thanks so much for stopping by! I totally agree! Sometimes it’s just not worth the time and effort. If you find something you love in the store, and you can’t make it for a lower cost, why not buy it? We should never feel guilty for this! 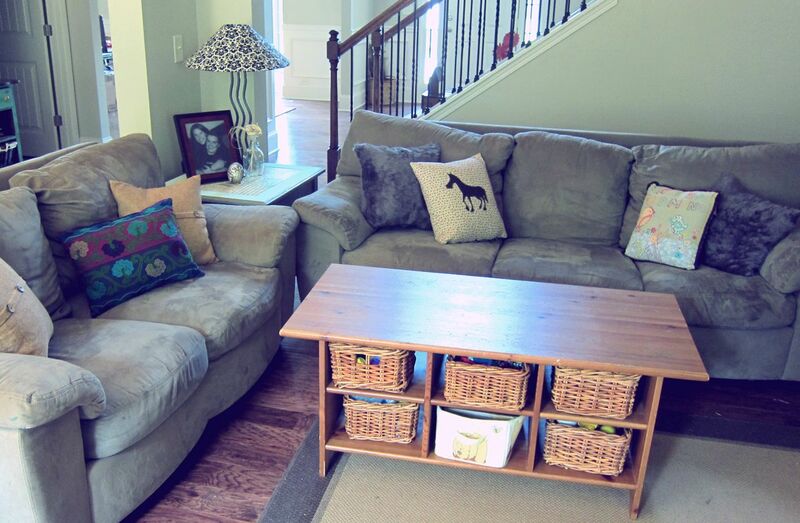 I’d say I have a pretty balanced amount of stuff “bought” versus “made” in our home. And I’m perfectly fine with that!